I have used essential oils on and off since I was a teenager – mainly as aromatherapy – but it had never occurred to me that the quality of oils I was using matters. When I first experienced dōTERRA I was blown away by the difference of these Certified Pure Therapeutic Grade essential oils and was curious to learn and experiment more. Within a couple of weeks one sample had turned into an entire box and now my oils are an everyday part of my family’s wellness journey. Essential Oils are natural aromatic compounds found in the seeds, bark, stems, roots, flowers and other parts of plants. They are known for their powerful aromas and have been used throughout history for medicinal and therapeutic benefits. Modern day scientific study and trends towards more holistic approaches to wellness are driving a revival and new discovery of essential oil health uses. As you read my blog, over time, you will discover many different ways to integrate essential oils into your life and you will understand better the difference they have made to my daughter’s life in particular. Everybody’s needs and uses of essential oils will be different, but I am confident that one day in the not so distant future you will be sharing your oil obsession with friends and family! dōTERRA are therapeutic grade essential oils that are 100% pure and natural, safe and can support the body’s natural ability to heal. There are very few certified pure and therapeutic grade oils on the market, but I wouldn’t trust anything else to put on and in my daughter’s body. Many of the oils you see on the shelves are synthetic and contain fillers, carrier oils, preservatives and other things and the oil itself is just not of high quality. dōTERRA’s oils have no fillers, no preservatives, no additives and no carrier oil. They are 3rd party certified as pure and you experience the potency when you use them. I have gone from using 8-10 drops of the previous oils I used in the diffuser to just 2! 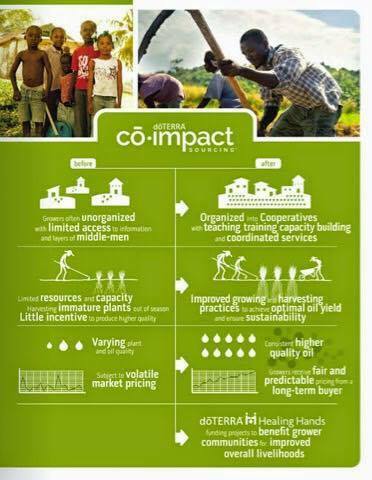 dōTERRA empower indigenous communities throughout the world to plant, cultivate and harvest endemic species of plants in their indigenous habitats, so the integrity of the plant extracts are at their purest and the community/environment benefits from ethical and sustainable practices, jobs are created and farmers are supported. These oils are therefore beyond organic and fair-trade in their own right and dōTERRA’s co-impact sourcing is making a big impact, in partnership with their charity, Healing Hands. Watch footage here for an overview of their initiatives. dōTERRA has such a large community that the amount of information available to support you in your essential oil journey is seemingly endless! dōTERRA itself is a great place to start. Check out mydoterra site for tips on healthy living, DIY and recipes. Many other people blog about the ways that they use dōTERRA for health and beauty and to clean. Pinterest is full of “how to” pins – beautiful gifts to create, DIY non-toxic cleaning products and ideas to support health. There are also facebook pages. If you are interested in trying out dōTERRA’s beautiful essential oils you can click here to learn more about dōTERRA and see the full range of dōTERRA essential oils and products available to buy. If you intend to make more than a couple of purchases a year (or even more than a couple of oils at once) it makes sense for me to set you up with a wholesale account to receive a 25% discount off the retail price of all future orders. This only requires 1 order per year to keep the wholesale discount open and wholesale membership is only US$35 (around NZ$50) for the first year. You can do this by clicking here. The cost to renew is US$25 in following years. When you enroll with a Custom Kit, the wholesale membership fee is waived the first year. If you would like more information or have questions, please contact me. I also make my own range of beautifully natural wellness, skincare & spa products, rollerballs, balms & sprays, plus make-to-order, customised blends for your needs. You can view these at my Online Apothecary here. Essential Mum products and dōTERRA essential oils completely natural. Essential Oils are 100% pure and are grown from plants, trees and shrubs etc without pesticides/herbicides/fungicides and other chemical fertilizers and in a sustainable way. They are non-GMO, Fair Made and free from: Other Harmful Chemicals, Parabens, Fragrance, SLS/SLES, Propylene Glycol, Silicone and Artificial Colours. Essential Mum products are therefore formulated with only nature’s finest ingredients; including dōTERRA essential oils, cocoa butter, coconut, almond and other carrier oils, and antioxidant rich vitamin E oil.